Markers 4 U, Inc. is the Internet’s source for quality water based paint markers. Whether you are working for a car dealership and need to mark prices on windows or are a hobbyist who is just on the hunt for a dependable paint marker that will last, you can count on us to provide you with great Uni Posca markers. These selections are available in multiple colors, including red, yellow, purple, and green. 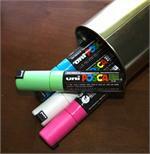 Our selection of Uni Posca markers includes extra fine, fine, medium, broad, and extra broad selections. The extra fine options are ideal for making detailed markings, while an extra broad paint marker works well for large lettering. Our business has more than 17 years of experience working with water based paint markers, so you can be confident that our business has the “write” markers for your needs. Take a look at the selections we have here and place your order with us today! 22 colors. 1mm wide bullet tip marker allows superb coverage and great detail. 32 colors. 3mm wide fine bullet tip marker allows superb coverage and great detail. 39 colors. 5mm wide bullet tip marker allows superb coverage and great detail. Six bright Flourescent colors: Green, Light Orange, Orange, Pink, Red & Yellow. 8 mm chisel tip delivers a variety of line sizes. Marker has a 17mm X 10mm tip with beveled edges which is great for large lettering. Posca Extra Broad Markers now available in 10 Colors: Black, Blue, Gold, Green, Light Blue, Pink, Red, Silver, White & Yellow. 29 colors. 8mm wide chisel tip marker allows superb coverage.